In a small bowl add in 3/4c warm water, sugar and yeast and let sit for 5 minutes before stirring. In the bowl of a stand mixer or large bowl, combine dry ingredients and then add in the yeast mixture and remaining water. Mix well to form a dough ball. Knead for 10-12 minutes by hand or 8 minutes with a dough hook to form a firm dough ball. Let rise covered with a damp towel in a buttered bowl for 1 hour until dough has doubled. Punch down and let set for 15 minutes. Divide the dough into equal pieces. I normally do 8-10 pieces and will sometimes use a scale. Roll each piece until it becomes a smooth ball. I read on another website a technique which works well, use the palm of your hand to firmly press down on the dough while moving in a circle and slowly releasing pressure as it forms into a ball. Using your finger create a hole in the middle, stretching it to form a ring of dough. Let sit for 10 minutes under a damp cloth. Preheat oven to 425 degrees. Boil water in large pot/s (I normally have two pots going) and slightly reduce heat while boiling bagels 1-2 minutes per side. 2 minutes equals a chewier bagel. I found just over a minute was the sweet spot for the bagels to not be too chewy the next day. If you are going to top your bagels, use an egg was of one egg and 1 T water to help the topping stick. I like to brush mine with melted butter or butter and other flavored olive oil from Harvest Oil and Vinegar. Bake on parchment paper for ~20 minutes or until golden brown. If you are going to freeze the bagels, slice before freezing. 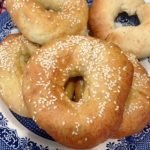 For asiago, cinnamon crunch and other bagels like that, skip making the hole and cover the entire top of the bagel before baking.